That's A LOOOT of products in one box!!! I will give a detailed post soon. OMG the box!!! :D Ang daming laman! Gosh. I can't wait for this!! I think I definitely got to go to SM MOA that is! woooowwww >____< So a lot! Congrats! You deserve that gift for all the consistency, hard work & dedication for your blog. Good things comes for those who has "awesome make-up & accessories! OMG. I actually just bought those makeup cleansing tissues and the QuickFX stuff! I love them. 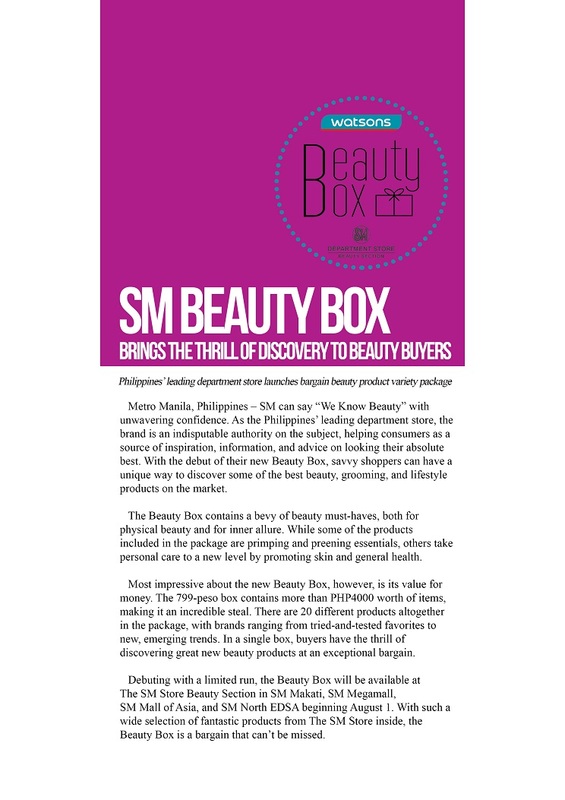 :) I don't know how they plan to work it, if it's a subscription box too or if it's gonna be sold in SM Department stores, but woooow that is a LOT of stuff. Super sulit for only 799! yup, that's a looot!!! :) great. Wow that's such a huge box and the goodies inside are soooooo :) Oh the perks of being a blogger. :) Sometimes I wish I'm a blogger too :) hehe. how does one avail of the box?